Anyone searching for a small pocket size Bluetooth speaker that can be attached to almost any surface and is also water resistant and rugged, may be interested in the Sticky Sound which has been created by London Lazerson. 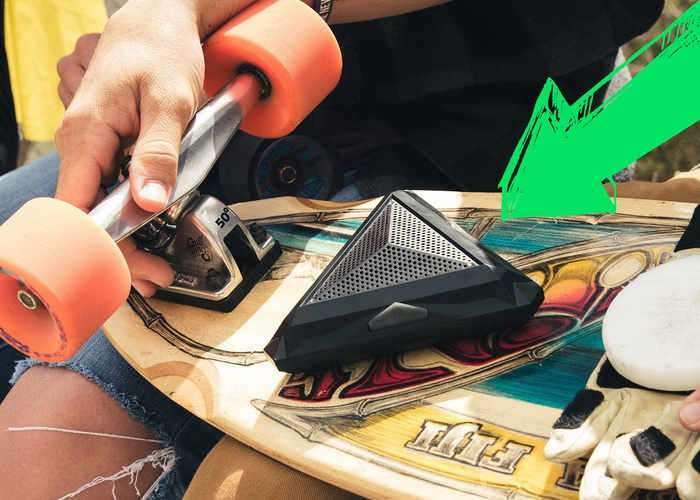 Watch the promotional video below to learn more about the “world’s first Bluetooth speaker that mounts to anything” say it’s creators. Introducing Sticky Sounds. The world’s first Bluetooth speaker that mounts to anything, is water resistant, and is INSANELY rugged. Welcome to the next generation of adventure speakers. We’re founded on the idea that your music should be able to go anywhere with you, and not just in the hands of the guy or gal on aux duty. Because if we’re truly honest, music is meant to be enjoyed by anyone, anywhere. Forget leaving your speaker on your study desk and turning on your “Chill” playlist. Take Sticky Sounds skateboarding, kayaking, skydiving, hiking or wherever you want to listen to the music that makes you who you are. We’re on Kickstarter because of you. We’ve recently purchased few of our components for our next batch of speakers, but we lack the funding to buy the next round of rugged plastics, interior components, and assembly. This next round will include amazing new colors and designs. If we can’t get past this round of funding, we’re going to be shutting something down that represents not only a personal dream, but a wonderful solution to a common problem. It’s up to you. For more information on the new Sticky Sounds Bluetooth Speakers jump over to the Kickstarter website for details by following the link below.